A lean thinker will always continue to push on boundaries whether it be around processes or how things are viewed. It isn’t an easy road to continually be pushing against the normal thought pattern but when it works out it is very rewarding. One big breakthrough makes up for many failed breakthroughs. The automotive supplier I worked for specialized in plastic trim parts. The parts had three finishes: molded in the color, painted or chrome. The facility had 30 injection molding presses ranging from 500 ton to 3500 ton. In order to reduce inventory and shorter our lead time we had the hair-brained idea to actually connect four molding presses to the chrome plating line. It was hair brained for two reasons: 1) we needed to moved 1800 ton presses and they weren’t easy to move and 2) the chrome plating line racks were 10 ft x 15 ft so a pit would have to dug in the concrete next to the molding press so rack could be lowered to where operators could load the top of the rack. Studies on paper showed the molding cycles and changeover times lined up nicely with our rack storage capacity for the plating line as it was. The savings was in the neighborhood of $250,000 or more per year in inventory, lead time and labor. The VP would not sign-off. He just couldn’t picture it. Fortunately, the plant manager wouldn’t drop it. So, I got approval to purchase a computer simulation package I had a history with and model the before and after states of the areas. It took about three months to get refreshed with the program language and then create the base models. We then spent another couple of months tweaking and playing with scenarios. This allowed for a better estimate of the savings and to help visualize how the facility would work. We were able to present the idea again to the VP and he started to see and move on his original opinion. It took a few weeks of the plant manager following up with the VP before he finally gave his consent. From original idea to breaking ground was about a year. When it was done it worked very well. We reduced the lead time about about a week, freed up employees to work in areas where we had temporary help and saved approximately 20,000 sq. ft. of space. Nothing like this had been done before and even people in the facility said it would never work. When it did it opened up the possibilities for so much more. Unfortunately, I wasn’t there to see the “more” because I left and took a position at another company. * It can be hard and frustrating to not be able to get others to see the potential and just continue so squash ideas, but if you have just one or two of the right believers it can make all the difference in the world. For me, that was the plant manager in this case. * Sometimes you have to be creative to get people to change their views. You have to provide them with new positive experiences. For the VP, we couldn’t spend the large about of money to just do it and show him. We had to come up with a different way. That was the computer modeling. It allowed him to see things and ask questions to have a good experience in the new world. For the plant staff and employees, it was seeing the new idea actually come to life and work. * I learned how to be stubborn with my beliefs but to do it a positive manner and how to back up, regroup and take a different approach to get the message through. My time at Thomson Consumer Electronics came to an abrupt end as the company went from 2,000 people in the U.S. to 250 people in a years time. I got a job with Guardian Automotive. The facility I was hired into specialized in exterior plastic trim. Guardian’s customers included almost everyone during the five years I was there: GM, Ford, Chrysler, Toyota, Honda, Nissan, Harley-Davidson, BMW, International and Freightliner to name a few. The first few months was very frustrating. My manager and I were trying to make process changes that made since to us in order to reduce WIP. We wanted to move assembly next to the paint lines so there was no paint inventory, but people fought this at every turn. Then a big change happened. Guardian got a new VP of manufacturing and he brought in his director of lean. We were going to be a lean company. After years of studying Shingo and using lean tools, this was the first time I had heard the term “lean”. Everyone got pulled off-site for an intro to lean and a hands-on balloon simulation showing pull vs push. During the simulation, I leaned over to my manager and whispered, “This is what we have been trying to do for months with the paint lines.” I was anxious to see how things would go now. The couple hour simulation was the extent of our lean training. We were told to “go do”. Talk about ‘deer in the headlights’ after that. No real training and being told to “go be lean”. The first thing my manager and I did was re-establish the idea of connecting the assembly area to the paint lines. We discussed it with the plant manager and how it would be like the balloon simulation. We had his support and were able to complete the work within a few weeks. Over the next few years, the facility became a lean playground for myself, Joe Wilson (who also blogs on Beyond Lean), and our manager. We learned something, tried it, screwed it up, fixed it and made huge progress. Our time was a huge success in that the plant went from $500k in the red on $120 million sales to $8.5 million in the black on $90 million sales in three years. But it was a huge failure as well. We had phenomenal support to make the changes we did, but we didn’t change the leadership’s thinking. After we all left the plant was back in the red in about a year. I don’t say that to too our own horn, but as a lesson in how important it is to change people’s thinking and behaviors in order to sustain the change. I will be diving deeper into my experiences at Guardian moving forward. My family and I had a nice day at Schlitterbahn waterpark a couple of weeks back. It was a lot fun and the rides were great. While waiting in line for each of the slides, I couldn’t help but think about the very poor value stream management for the rides. For one set of three slides, the line was split in two. For two particular slides the line was to the right and for the third slide the line was on the left. When you got to the top the lines then crossed each other causing a ton of confusion and a park employee trying to keep the lines separate and correct. See the diagram below. Also, if one of the first few didn’t want to ride one of the two slides from the line on the right then that slide would sit idle for a few minutes until the riders on the other slide unclogged the line. It was a waste of time and use of the one slide. There was a second group of three slides at another part of the park. At this group of slides, two of them needed mats to ride down and the third needed a tube to ride the slide. They didn’t mark this line with two separate lines so people had to tell you there were two lines. Also, the mats for two of the slides were not stored at the entrance to the slides but at the exit. You had to fight people through the exit, get a mat, then walk back around to the entrance. All the tubes were stored at the entrance for the one slide. This caused over an hour wait for the one slide but only a 10 minute wait for the 2 slides with the mats. The way the park handled the value streams for the slides caused unbalanced lines and confusion for anyone that had not been there before. It was a great lesson in making things visual and easy to understand in order to make a better experience for the customer. Flow is a concept that lean teaches about how a product/service moves from beginning to end. When the product/service stops there is a disruption in the flow. This is when inventory starts to build between two steps in the process. The hard part for people with this mentality to understand is the product/service will only move as fast as the slowest operation. No exceptions. Period. Take a simple process like doing laundry at home. My dryer is always slower than my washer, so when I have multiple loads of laundry to do nothing moves faster than the time it takes to complete a dryer cycle. I move a load of laundry from the washer to the dryer and start the dryer. Then I add another load to the washer and start the washer. The washer always finishes at least 15 minutes before the dryer. Instead of taking the laundry out of the washer and piling the wet clothes in a laundry basket, I let them sit in the washer. Knowing the dryer is the slow part of the process, it would do me know good to start another load of laundry in the washer because it still won’t end before all the other loads have finished in the dryer. This is how we should look at the flow of our processes at work. It does no good to buy equipment or change the process to speed up a part of the process that is not the slowest step. In the end, the product/service is still being completed at the same rate. What is the dryer in your process? 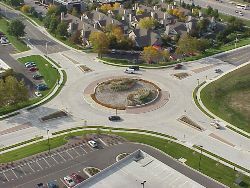 The city in the U.S. that I live in has started installing more and more roundabouts. The reasoning is it is “easier” for traffic flow. I don’t find that to be the case at all. I find them to be a pain to maneuver around and a hindrance to traffic flow. Many others that I have discussed this with believe the same thing. But they are used in Europe to help with traffic flow is the argument I get back from time to time. “Who cares!” was my reaction. Now imagine my chagrin when I discovered I was spending 2 weeks in the United Kingdom on business. My buddy and I spent a lot of time driving around the UK. To my surprise, the roundabouts were quite helpful and did help traffic flow. Change in attitude? No. Change in reason. Yes. As I drove more and more in the UK, I noticed how the roundabout did help traffic flow when streets weren’t perpendicular. 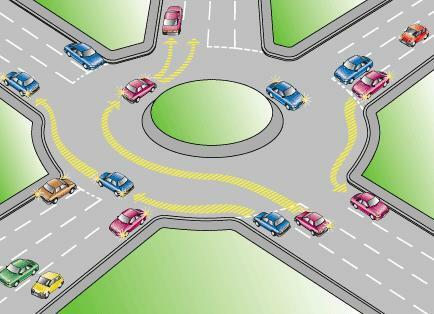 When streets were perpendicular stop lights were used with turn lanes just like in the U.S.
Cities are copying the roundabout as a solution for all traffic flow issues without understanding what it can be best used for. This is why it is best to understand why solutions or countermeasures are put into place so you know when and how best to apply that learning. Don’t copy solutions. Learn from them. A few weeks ago, Ultimate Factories on National Geographic premiered an episode about LEGO. My son is a HUGE LEGO fan and seems to have almost the whole LEGO City setup. So this episode really caught our attention. My son loved watching the artist/builders design the new Police Station and seeing all the sets being made in the factory. What caught my attention were the things that seemed lean like. Here is the full episode. It is 45 minutes long. Below are some highlights I picked out with time markers as to where they are at in the video. (1:15 – 4:10 in video) Right off the bat, the show describes how the artist/builders go about designing a product. The product manager takes his team out to real life sites of what they want to build to study them. They look at what the site has and needs to feel authentic. It is truly direct observation of what the team wants to build. (6:40 – 10:00 in video) LEGO takes full advantage of standardization as much as possible. The Police Station turned out to be a 700+ piece set, but none of the pieces are new and require tooling to be made. Because the designers were able to build the Police Station out of existing pieces they were able to use that budget to design a police dog that is brand new adding to the experience. My lean lens sees this as cost management in order to reinvest in innovation. The innovation leads to a better experience and more revenue. (36:12 – 36:20 in vide0) The video does not talk about 5S but there is some evidence of it. In this clip, you can see the tape outlines on the floor for the staging of finished product. (36:20 – 38:10 in video) In the 1990s, LEGO went through a period when sales were declining. LEGO decided to go and see why this was happening. They discovered their products were not meeting the needs of the adult customer, which is 50% of their market. People were hacking the Mindstorm systems and creating bigger sculptures with the robotics. They didn’t try to shut the hackers down. LEGO embraced them and created new products. They still invite customers to come in and help with designs. They are focusing on customers needs. Everything starts with the customer. These are some of the quick examples I picked out. If you notice, nothing I saw focused on lean manufacturing although I believe I saw some lean like things in manufacturing and distribution too. I would highly recommend watching the full video because it touches on every aspect of business. From customer focus to product development to manufacturing to logistics. It is very complete. If you are a LEGO fan, this video is a must see. In the comments below, tell me what you saw from a lean perspective. What did I miss? Last weekend, I encountered the pain of single piece flow during our master bathroom remodel. Sometimes doing the right thing is hard to do. This was one of those instances. As my wife and I were tiling the around the tub and inside the shower we knew we would need a lot of cuts. We knew we couldn’t just measure and cut a bunch of pieces to fit because of the odd angles. This is where the single piece flow comes in. My wife would measure a piece and mark it out. I would run downstairs and out into the driveway, cut the piece and then bring it back up to her. When I got back she would have finished installing the previous piece and measure out the next piece. I would take the next piece and go cut it and bring it back. The pain was physical. I have never climbed up and down so many stairs in a day. I felt like I was back in high school and the basketball coach had gotten mad at the team and told us to hit the stairs. Usually, I am at my standup desk. Not today! I am sitting in my chair. As hard as that got to be, it was the right thing for this part of the project. We would have wasted more tile with bad cuts if we would have tried to forecast what was needed. Understanding when single piece flow is necessary can be key. Sometimes people try to fit everything to a single piece flow as a first step in their lean transformation. Understanding the work being done and what waste may be created by doing batch vs. single piece is the first step to know how and when to implement single piece flow. Off to heat my legs. There is still more tiling to do. I have to admit this post is partly a rant and partly an example when single piece flow might have been taken too far. This past weekend I was McDonald’s with my family. We all ordered burgers and fries. We were the only ones in restaurant in line. Of course, the register furthest from the fry bin was where we placed our order. After our burgers were made and put on the try the worker went to get our fries. I was glad he waited until the burgers were finished because it took a few minutes. I thought he was trying to keep our fries nice and warm. Then it happened. I get hit with single piece flow. The worker walked slowly over to the fry bin. I mean slowly. Filled ONE small bag of fries and then slowly walked back to the counter and placed it on the tray. Then he walked slowly back to the fry bin. Of course, there was someone from the drive-thru filling fries so he waited. 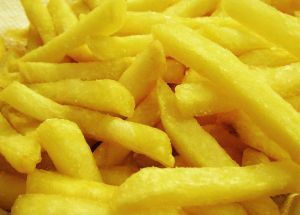 Then he filled ONE small bag of fries and slowly walked back to the counter and placed the fries on the tray. He did this two more times. Each time waiting for the drive-thru worker to fill 2 or 3 fries. I think I needed a clamp to shut my mouth it was open so wide in shock. By the time I got all the fries and got back to the table the first two bag of fries were cold. There was no way I was going back up to ask for more. There is a time for single piece flow and there is a time for a batch. The worker had a confirmed order and it was paid for. At that point, batching could be an acceptable solution to move the work through the process. As much as I push for single piece flow, always be aware of the process and situation and understand what is best to meet the customers’ needs.